March 10, 2014… Paul Gross, Steven Page and Hawksley Workman are headlining the Stratford Festival Forum’s Shakespeare Slam on Wednesday, April 23, at Toronto’s Koerner Hall. This celebration marking Shakespeare’s 450th birthday will be hosted by Artistic Director Antoni Cimolino, and will showcase the Festival’s 2014 season theme of Madness: Minds Pushed to the Edge. Tickets for the Shakespeare Slam go on sale March 11. They are priced from $39 to $54, with a student price of $29. To purchase, call the Stratford Festival box office at 1.800.567.1600. Tickets are also available through Koerner Hall. 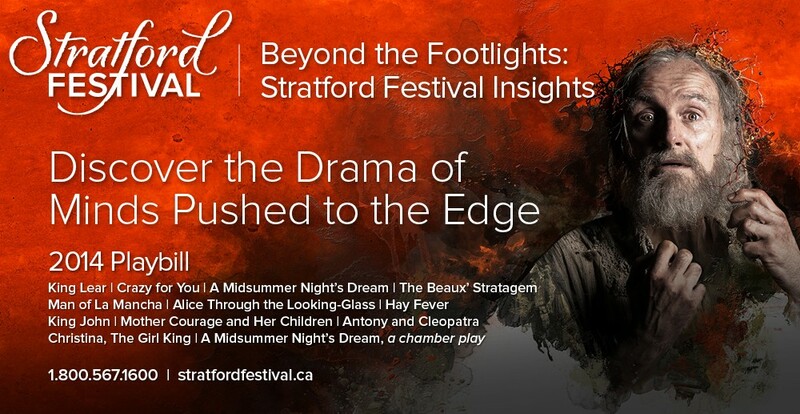 The Shakespeare Slam serves as the launch of the Stratford Festival Forum, which will present more than 200 events this season, including featured speakers Margaret Trudeau, Jian Ghomeshi, Muhammad Robert Heft and Camille Paglia, as well as concerts, comedy shows, screenings and performance showcases exploring the playbill and the theme of Minds Pushed to the Edge. The Stratford Festival Forum is very pleased to welcome Bell Let’s Talk as a new partner and the Host Sponsor for the Shakespeare Slam as well as selected Forum events that focus on mental health throughout the 2014 season. Sustaining support for the Forum is generously provided by Kelly & Michael Meighen and the T.R. Meighen Foundation. Support for the 2014 Forum is generously provided by Nandita & Julian Wise.